This is my first attempt, please don’t judge me.. I am at risk of spending more time trying to work out how to do this blog malarkey than I am spending sunbathing. For those of you who know me well, you will appreciate how that is impacting my stress levels. I keep reassuring myself that I have 5 months to get a tan, but if I haven’t nailed this blog in the next 5 days I may as well give up. The template had a cool “where am I now” tab, but can I find it?? Not for the life of me. I apparently have access to a 24 hour support centre so I suspect I may need to call on them. I did demonstrate my technical genius at the airport by phoning the helpline for assistance getting my hard drive to work, and (more importantly) then getting my hard drive to work (a small victory for a big technophobe), so I have faith that I will get there eventually. In the meantime it seems only appropriate to post in a manner that my parents can relate to.. “Got here safely, good flight, weather lovely, people very friendly, haven’t been mugged yet”. Or in my Mum’s texting style “Arrived . Gd journey .Weather gd . Bad reception. Wil TRY again in a few days . LOL Xxxx” (love you Mum, but you know I am right about the texting style). So as most of you know, my first stop is a bit of a concession to luxury and I am staying in a lush spa in Ubud, Bali. It is some much needed decompression time and it is rather lovely. I have slept lots, started 2 books, had an amazing Balinese massage, drunk a few lychee martinees….just chilling. 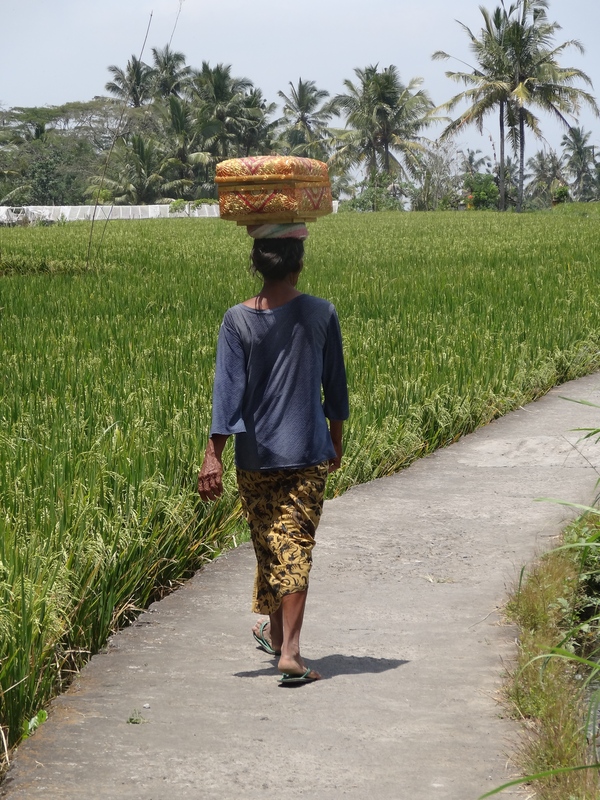 I did however feel a bit of a fraud today as I went out on a morning guided bike tour around the Ubud countryside and saw the real Ubud/Bali – and instantly wished I was staying somewhere a bit more authentic. However that is coming down the line – when I come back to Bali from my diving trip to Gili Meno, I am doing a home stay for a couple of nights before my trip to Lombok starts, so I don’t feel so bad. I had a brilliant guide – Merta – who started the trip by making me practice changing gear and using the brakes, which was sensible, given I haven’t been on a bike for some years. He then took me to the compound where his family live – compound not so much in the large, secure, ex-pat sense, more a series of single dwellings in a gated area, with a communal social area and, most importantly, its own temple. I was fascinated by the fact that outside each compound we passed was a chalk board with the name of the head of the family, together with the other occupiers, and the numbers of males and females. It is slightly odd being asked within 10 minutes of meeting a man whether I am menstruating – but it would have meant I couldn’t have entered the family’s temple if I was. In keeping with my affinity for religious places I almost passed out, hopefully just the heat and not any kind of karma. I recovered sufficiently (having promised Merta’s mother-in-law, who was with us at the time that I had had my breakfast – see Mum – there is a mother figure everywhere!) and we went from there to another temple in the village and watched the female priest prepare the day’s offerings. To enter this temple I had to put on a sarong, tied with a separate sash at the waist. It is believed that this is necessary to ward off evil (contained in the lower half of the body – God being in the head, and the torso being the human). * I am not going to pretend that I took on board all of the different gods and religious rites that Merta was describing to me. I was however struck by the profound and simplistic faith that he had. You had to leave your evil thoughts at the gates of the temple, or reframe those thoughts in a more positive way as you entered. Or yin and yang, as he put it. I googled yin and yang this evening as I wrote this and found a world of different quotes. The one I liked the most, was this: “Either learn to love thorns, or don’t accept any roses”. Too true. I love thorns. I am still however trying to reconcile this faith, and the fact that it is practised by most Balinese, with the fact that as we rode through a more affluent village and I queried this obvious difference, Merta told me that many of the people in this village made their money gambling on cockfighting. As he told me this we went past a house bedecked with cages full of the birds and I felt slightly uneasy – not part of the culture I will be looking to experience. We then rode through the countryside into the rice fields – and into a different world. Green as far as the eye could see, an intoxicating smell of vanilla and magnolia, and the sound of wind chimes to ward off the birds. Magical. We cycled down narrow tracks with a steep drop on one side, every time Merta told me to “be careful” I tensed up that little bit more (whoever coined the expression “its just like riding a bike” was lying). I had to remind myself that it was like skiing, the more you relaxed, the easier it got, and the less likely you were to fall off/over. I also discovered the mimosa plant – the “touch-me-not” plant whose leaves fold and stems droop if you touch them. Hours of fun…. (I tried and failed to upload a video clip). After a stop for some coconut water from a local seller, we headed back to the spa, not before taking my life into my hands by cycling down the main road through Ubud – I am not sure it is possible to have more mopeds on one road, and with potholes in equal measure. I just had to close my eyes and hope for the best. I wasn’t sure if I was being dramatic until I got back and read a guide to Bali which had a “Luxe Loves” and “Luxe Loathes” section – under loathes were “Plastic bags and potholes – the scourge of the wayside” together with “Traffic – maddening and downright dangerous“…. not just me then. It is fair to say I am a touch saddle sore now, but absolutely loved it and feel like my journey has now begun. No plans for tomorrow other than to work out my route to get to Gili, which I think needs to start very early on Sunday morning if I am to catch the fast boat, which all reviews suggest is going to make me very sick…. but there is no other way! * On a more frivolous note, it struck me that maybe I should wear a sarong to the office – would the same concept of warding off evil apply??? (no reference to my lovely colleagues intended, but those in the know, know exactly what I mean).